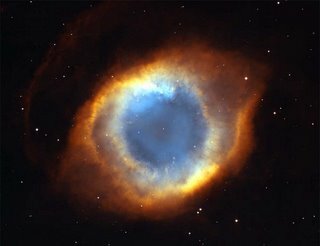 The “Eye of God” gas cloud, a star remnant catalogued NGC 7293, is in the Helix Nebula and is about 650 light years from earth in the direction of the constellation Aquarius. It’s about 2.5 light years across. It’s direction of explosion gives us a unique view in that we are looking directly down the gas helix instead of side on.